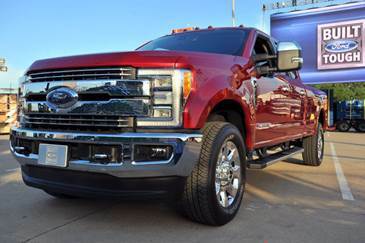 For the 2017 model year, Ford has introduced major changes on its Super Duty pickup line. Two of the biggest changes are in the construction of the vehicle and the array of technology available. For the 2017 model year, Ford has done away with the steel construction of the body of the vehicle and transitioned into a new high strength aluminum alloy. Those concerned about the replacement of steel with aluminum need not worry. The aluminum construction has a better strength to weight ratio than steel and won't rust like steel. Ford took some of the savings in curb weight from switching from steel to aluminum to enhance several other components of the vehicle. 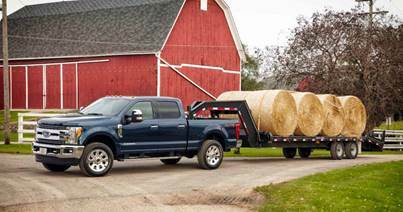 First and foremost, Ford constructed the frame of the new Super Duty pick up models with 95% high strength steel to help increase payload. This has helped increase payload while maintaining a lighter truck. 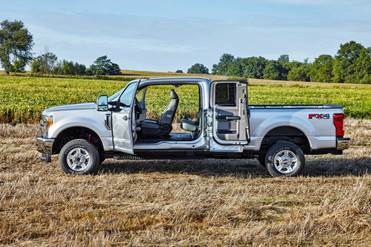 For example, the 2016 Ford F-250 4x4 6.75' bed went from a curb weight of 6,828 lbs and a payload of 3,100 lbs to a curb weight of 6,478 lbs and 3,450 lbs payload. That's roughly a 5% decrease in curb weight while an increase of over 11% for the payload. Longer wheelbases of each model have also allowed for an increase in an extra inch or two of leg room for all passengers. The rear doors open a full 170 degrees to allow a wider opening for storing items in the back seat. 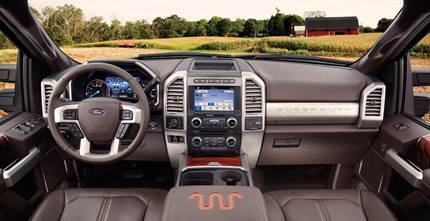 Available on any model and standard from the Lariat trim level and higher, Ford's SYNC 3 helps you stay in the loop while you are on the go. 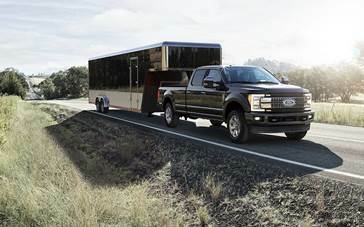 With hands and eyes free texting, Apple and Android phone integration, and 8" touchscreen, the new line of Ford Super Duty trucks lets you bring your office on the road. The technology doesn't stop inside the cabin. With optional Ultimate Trailer Tow Camera System, drivers will have seven cameras to help navigate their trip. The final camera is delivered in a kit, intended to go on the back of your trailer so that even when backing up your haul, you'll always have a clear view. As if the additional cameras were not enough, the innovative Trailer Backup Assist helps guide the vehicle in reverse in the tightest of situations. BLIS (Blind Spot Information System) not only extends the length of the truck, but uses radar hidden in the taillights to extend the blind spot coverage to the trailer. Other technologies such as LED lighting, adaptive cruise control, and lane departure warning system help keep you safe while on the road. 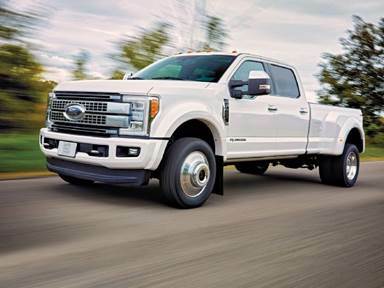 Ford continues to maintain their status as one of the main players in the pickup truck game. The innovation in both technology and construction of the vehicle have left quite the challenge for the others in the market to compete with. 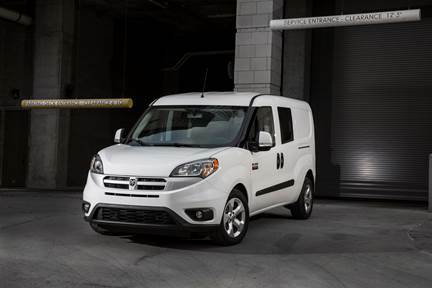 When it comes to selecting a compact van for your job or worksite, look no further than the RAM ProMaster City. Boasting a 29 MPG highway rating with the 2.4L Tigershark Multiair Engine, the ProMaster City is a great way to move materials or people around efficiently. The ProMaster City was awarded the 2016 Commercial Green Truck of the Year from Green Car Journal, noted for its low environmental impact. The class exclusive nine speed transmission allows for quick take off capabilities, as well as lowered engine speed in higher gears for enhanced efficiency. Which ProMaster City is Right for Me? 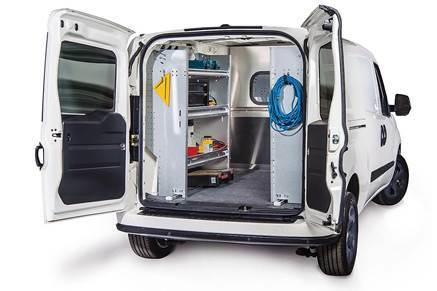 While the ProMaster City most commonly used as a compact panel van, it can also be used as five passenger wagon. This capability allows you to move people comfortably from job site to job site. 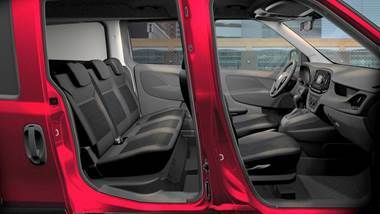 The ProMaster City comes in two different trim levels. 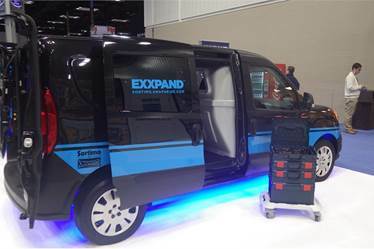 The base Tradesman trim level is more than capable of handling your needs of a compact cargo van. For those looking for a few more bells and whistles, the SLT trim level comes standard with upgraded cloth seats, a 5.0 inch touchscreen display, power heated mirrors, and other premium features. 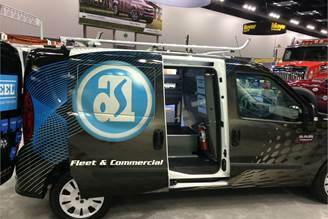 From a basic shelving package or ladder rack to a complex bin system, the RAM ProMaster City can be upfit to meet your business needs. Wrap your company logo around the exterior to maximize your presence and stand out from your competition. MOPAR parts and accessories such as cargo partition doors, tow packages, and roof racks are all available on both factory ordered units and pool units.